Not so very long ago, Western Australia was considered a tourist backwater, even by Aussie standards. It takes four days to drive across the dessert from the nearest big city to Perth. It’s the most remote state capital in the world and wasn’t until relatively recently that travel providers and tour operators started to wake up to the real potential in Western Australia- the amazing wildlife. Ningaloo reef it’s possible to swim with manta rays and sea turtles in a beautifully unspoiled marine environment, but by far the most spectacular wildlife experience Western Australia has to offer is the whale shark. These massive creatures are up to 12.6 metres or 41ft long and 36 tonnes in weight. Their open mouths can measure almost 5ft across, but they’re also slow, gentle, and like the basking shark, they’re filter feeders and eat nothing bigger than a pea. Usually whale sharks display little interest in tiny human swimmers and they certainly won’t swallow one. Floating in the calm, clear sea while the biggest fish in the world passes serenely by is the experience of a lifetime. It’s difficult not to be moved by the huge visitors, so spectacular and so unperturbed by the presence of humans. To them, we’re no bigger than kittens, but unfortunately it’s human action that has made these incredible animals a threatened species. The remaining population is more or less unknown. Perhaps because the eco-tourism operations around Western Australia are relatively new compared to the incredibly popular Great Barrier Reef tours, conservation is taken very seriously. There seems to be a higher density of ‘eco tour’ operators here than almost anywhere else in Australia. Facilities built with low impact in mind are easy to find and sensitivity to the value of the reef is the norm rather than the exception. Whale sharks visit Australia’s Western coast from March to July. 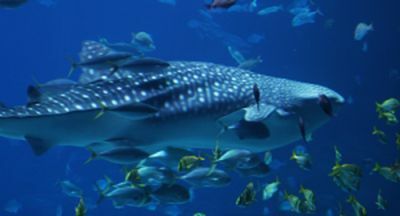 There are plenty of guided day trips available and at places like Ningaloo, they’re fairly reliable and the boats have a good chance of finding whale sharks and allowing visitors to snorkel, scuba dive, and swim in their presence. It’s not all about the whale shark either. True whales are regularly sighted and so are dugongs (marine mammals similar to manatees), dolphins, sea turtles, countless different fish species, and manta rays. The mantas get up to a considerable size too- up to 25ft from wingtip to wingtip, and like the whale sharks they’re largely harmless to humans. Jess Spate the author of “The swimming with whale sharks in Western Australia” grew up snorkelling and diving in Australia but now lives in (much colder) Wales. She writes for a number of travel websites in the UK and abroad.